1 to 3) Rex Features - Homepage - Crown Prince Frederik participating in the European Dragon Championships, Ireland, 18 August 2003. 4) Rex Features - Homepage - The Danish Crown Prince Frederik participating in the European Dragon Championships with Lars Hendriksen and Kasper Harsberg , Ireland, 18 August 2003. This morning his girlfriend and the 2 crew&#39;s women were spotted at the key - they spent the day on a boat watching the races - saturday night there is to be a dinner. Freddie finished sixth in the race (not so bad). VISITING Danish Crown Prince Frederik was yesterday marching with a military tattoo of a different kind. After enjoying a day's sailing aboard Nanoq, the Prince returned to the Cruising Yacht Club looking refreshed and relaxed in shorts and a T-shirt. He'd spent several hours putting the Danish boat through its paces around Rushcutters Bay and outside the Heads. Keen observers spotted one of the Prince's two tattoos -- of a shark -- on his right leg. The shark tattoo is believed to be the insignia of a Danish elite forces unit. But the Prince's other tattoo, bearing his nickname Pingo, on his left arm, was not on public display. Prince Frederik joined the army in 1986, enlisting as a lowly private in the Royal Life Guards instead of being commissioned as an officer. The Prince will compete in the Farr 40 world titles off Sydney Heads against some of the world's best sailors. For the championships, and the pre-world regatta which starts on Thursday, he will have a crew of eight on Nanoq (Danish for polar bear). They include Anders Myralf, a well-known sailor whose brother Stefan steered Nokia to her race record victory in the 1999 Sydney to Hobart. Princess Mary is due to arrive in Sydney on Thursday. On last night's TV news we had extensive coverage of Frederik practicing his yachting, with his shirt off. Shame I don't have any photos to share. Polfoto 23-02-2005 Crown Prince Frederik of Denmark, right, sits on the helm while training in Sydney, Australia, Wednesday, Feb. 23, 2005. Frederik spent the day on board his yacht Nanoq training for the Far40 Rolex sailing regatta which starts Tuesday, March 1, 2005. Polfoto 24-02-2005 HRH Crowned Prince Frederik of Denmark 2nd right, in action during the first race of the Rolex Farr 40 world championship in Sydney, Australia, Thursday, Feb. 24, 2005. Crown Prince Frederik has proved he'll be a contender at next week's Farr 40 world championships, with strong performances off Sydney Heads yesterday. Sailing his yacht Nanoq with a crew of eight fellow Danes, the Prince raced to two top-15 placings on the opening day of the pre-world championships. The Prince has won hearts with his friendly disposition and lack of airs in sailing circles since his arrival in Australia and has spent most days training or racing his yacht in preparation for next week's titles. On Sunday he will attempt to level the score with his wife in a match-racing challenge on Sydney Harbour. Last night Prince Frederik and eight members of his entourage dined at Hugo's restaurant at Bondi. He appeared to be in a relaxed mood, joking with his friends before leaving at 10.30pm." Crown Princess Mary arrives in Sydney in about an hour, so things should start to get interesting. 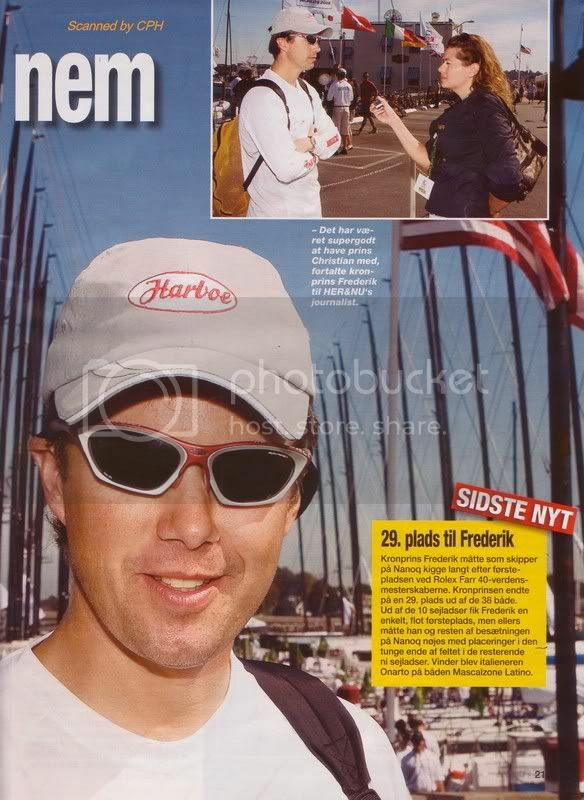 Here are pictures of Crown Prince Frederik participating in the Dragon Gold Cup 2005 in Sandhamn, Sweden. I think these are taken yesterday. From Polfoto. 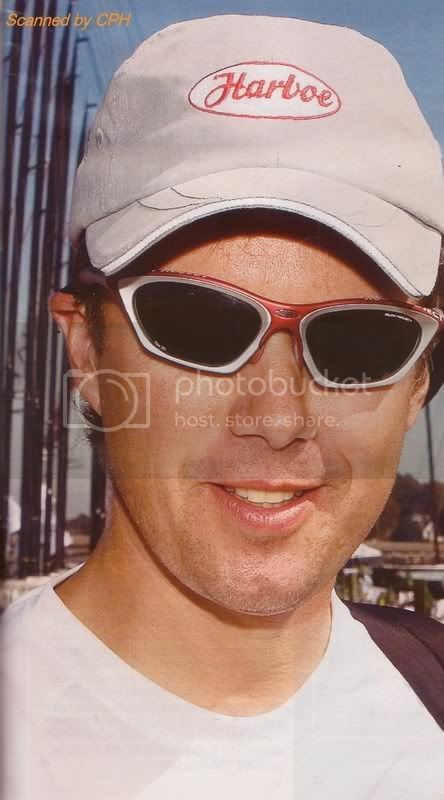 Picture taken 28 April 2006 shows Prince Frederik of Denmark (2ndR) and his crew sailing the NANOQ yacht during the second edition of the Rolex Capri Sailing Week, a week of one-design racing in the Bay of Naples, off Capri, southern Italy. HRH Crown Prince Frederik has left Denmark, and thus his wife and son, for a period of time in order to take part in the prestigious FARR 40 World Championships in Newport, USA. The championships take place on September 6 and 37 boats from all over the world will compete for the cup and the engreved Rolex! According to gossip.tv2.dk, His Royal Highness has never been away from his son for so long. Frederick, Mary and Christhian are in the US? Anybody have pictures of their small vacances? 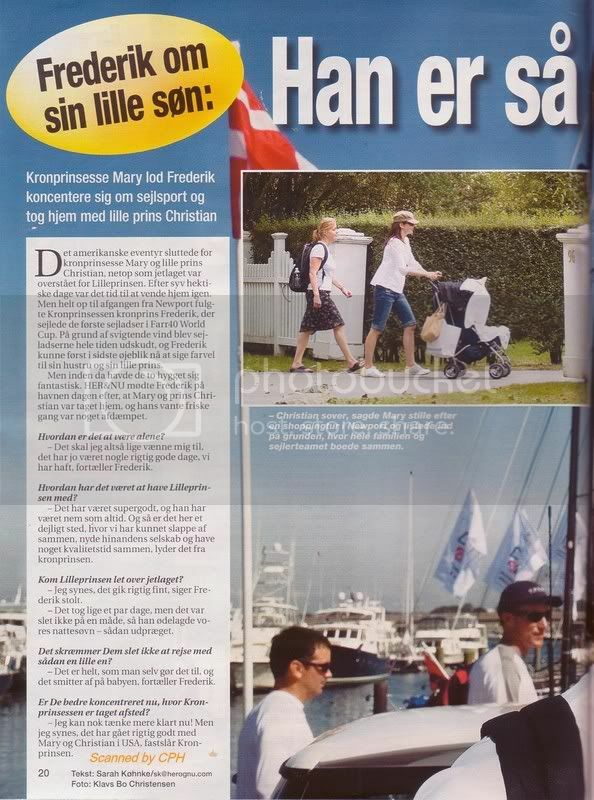 Great scans from Her & Nu (with major thanks to cph from the CPMMB, posted with permission) of Frederik, Mary, and Christian (in a stroller, too bad we can't see his face) in Newport, Rhode Island. WOW lol are they still in the US Id like for them to head my way so I Can congradulate them on their son (like thatll ever happen) hope they enjoy their time here. Fred was participating in a sailing event so Mary and Christian joined him for a few days.